Personally, I feel that if Schoenberg’s popularity is based upon merely university music programs and pen-pushing musicologists, then he’s popular for all the wrong reasons. The bottom line for me is I don't think silly rhetoric like those quotes from that Reilly guy has any bearing on Schoenberg's popularity. In the scheme of things in classical music, Schoenberg is relatively popular, more popular than most of the composers working in his day. And I think his popularity, such as it is, is mainly determined by how people react when they hear his music. His music is different from what came before and I hear it from both sides - that he is defamed by cretins who condemn his music as noise, and that he is pushed by music school elitists who despise the beauty of "tonal" music. I find both narratives equally unconvincing. Certainly agree that Schoenberg will never be popular (and that, while there is a customary popularity of a number of LvB works, there is much LvB that won't ever be popular, either). Bearing and control are IMO beside the res. The Reilly crusade-in-a-chia-pet is a data point, not a driver. You asked why I was starting the whipping boy discussion. I do not consider it unmanly to admit that I am incapable of starting a thing which has never really stopped. Anyway, I do not believe that you and I have any quarrel. I was only glad of the discussion as an occasion to vent about this resurgent blinkered philistinism, masquerading as a Defense of the Sacred. Sure, he has every right to say whatever he pleases about Schoenberg, how silly soever. And I make free to point out that I've seen better heads in Dr. Mgumbe's Shrinkery. I encountered Schoenberg's music simply through wanting to explore the repertoire and follow it wherever it led. I still have yet to take part in a single university class on music theory or history. But would you agree that Schoenberg’s popularity, or lack thereof, is based on assumptions that seem misguided? You really don't want me to answer that question and bring that topic up again. I first encountered Schoenberg in a college-level intro music course. It didn't make an impression at the time, since mainly they talked about and made us listen to those suites of short pieces for orchestra, which to this day I find utterly uninteresting. Later I came across Boulez' recording of VN in sextet form, which I found mesmerizing, and worked from there, eventually coming to like the long-form serial works. I remember finding the Suite on the same CD to be utterly incomprehensible, although now I've gotten to like it. It still amazes me to this day that this music from Schoenberg, Berg, and Webern still hasn’t quite had the breakthrough it deserves. There are still people who view this music as something that belongs to a horror film soundtrack. I personally find much of the music from these three composers to be quite beautiful, haunting, and intensely passionate. Funny you should come up with this analogy, because years ago when I was getting to know this music, I thought it would be great as the soundtrack for a noir-ish murder mystery, with nocturnal streets full of mist, the distant glow of the street lamps, and the clink of glasses at the nearby wine bar. All filmed in luxurious black & white of course. In other words, not a horror movie but something very atmospheric and seductive. Anyway - I've managed to hear plenty of live Schoenberg, Berg and Webern in my time, and it always draws decent-sized, enthusiastic audiences. If these guys aren't as popular as Mozart or Tchaikovsky, so what? They have their audience. As for Robert Reilly, I've been aware of him for a number of years. He's one those "good bad" guys. Good, because he points people to composers they might like, but whom they might not have discovered otherwise. Bad, because he covers everything with a sheen of ideology. And picking on Schoenberg this late in the game is just tiresome and old hat. Indeed. I wanted to like the book, because he dedicates chapters to a number of composers of whose work I think highly, but who remain relatively neglected in the "serious literature"; but in flogging his horse, he also populates his book with some of the C-Team. If the Pink Harp had made six years of serious study, he would probably end up something like Reilly. Perhaps this has to do with the influence of Bernard Herrmann? His film music doesn't really sound much like Schoenberg but it has a harmonic palette with some of the same sonorities. Most horror movie soundtracks today seem to have pseudo-Penderecki stuff on them. Aleatoric sul ponticello strings are a favorite device for creating unease. I don't personally think it's wrong to try to find parallels with more familiar popular culture for something that's unfamiliar; the main problem is that it's reductive. Characterizing Schoenberg's music as a wallow in angst and terror is like characterizing Mozart's music as a relaxed drawing room. It may work to give someone a point of reference, but it ceases to have much meaning once you get deeper into the music and discover the tenderness and lyricism in Schoenberg or the drama and tension in Mozart. I feel similarly. There's nothing wrong with not liking some music and wanting to discover music that fits your tastes better, and if you bring other people along for the ride, that's even better. Trashing one composer in order to bolster another is, generally speaking, poor advocacy. I am hesitant to participate in these discussions because my real life experiences with Schoenberg run contrary to many of the observations I have read in many internet forums over the years. One other forum that I occasionally participate is dominated by an anti modern music faction. I eventually discovered that many of these members have a very constrained view of the world of classical music. Some of them are Americans and they think that what is applicable here is also occurring in the rest of the world. For many there only exposure to classical music is the recordings of what they listen too or what they read about it in internet forums. Many of them rarely attend concerts and when they see a concert that programs a work by Schoenberg they do not attend it and have no idea how audiences react to his music. Most people who attend concerts on a regular basic have a completely different view on the state of classical music. Many of us here are amateur or professional musicians. I am an amateur bassoonist. I play with three groups and on a weekly basis have interactions with dozens of people who follow music. Some real life examples I have had with Schoenberg. I recently attended a performance of Schoenberg's Verklärte Nacht with the strings of the United States Marine Chamber Orchestra. They received an extended standing ovation from a very enthusiastic audience. What wonderful imagery. If I were a filmmaker, I’d definitely use classical music as my soundtrack, because, quite frankly, good film music is just hard to come by these days. Edit: Without even realizing it, I inadvertently opened up a whole can of worms about the degradation of film music. One other forum that I occasionally participate is dominated my an anti modern music faction. I eventually discovered that many of these members have a very constrained view of the world of classical music. Some of them are Americans and they think that what is applicable here is also occurring in the rest of the world. For many there only exposure to classical music is the recordings of what they listen too or what they read about it in internet forums. Many of them rarely attend concerts and when they see a concert that programs a work by Schoenberg whey do not attend it and have no idea how audiences react to his music. Most people who attend concerts on a regular basic have a completely different view on the state of classical music. Many of us here are amateur or professional musicians. I am an amateur bassoonist. I play with three groups and on a weekly basis have interactions with dozens of people who follow music. I recently attended a performance of Schoenberg's Verklärte Nacht with the strings of the United States Marine Chamber Orchestra. The received a extended standing ovation from a very enthusiastic audience. Did Boulez actually conduct the string sextet on that disc, or only the Suite op. 29? 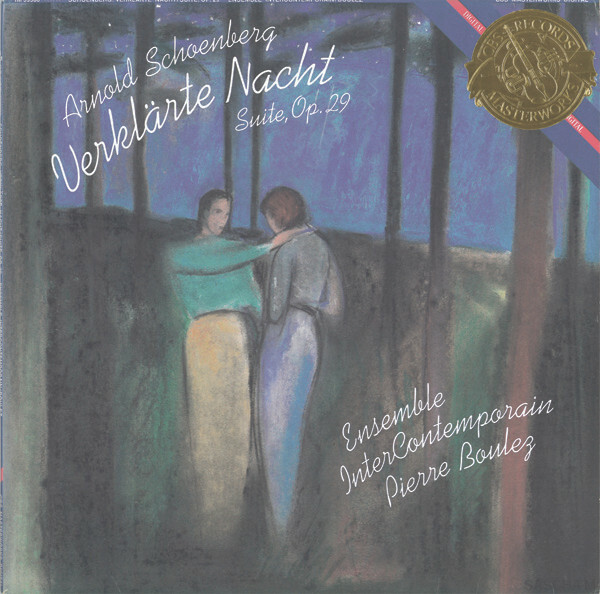 Verklarte Nacht is usually performed without a conductor. (Not that I am genuinely surprised.) In the light of the contemporary incomprehension of Verklärte Nacht, I am especially noticing how the First Chamber Symphony is largely (by turns) heroic and cheerful. I've long been convinced that the first allegro theme is Schoenberg's take on Strauss's Don Juan. The character is very similar. I believe he oversaw the performance, but didn’t actually conduct it as the sextet version doesn’t require a conductor.